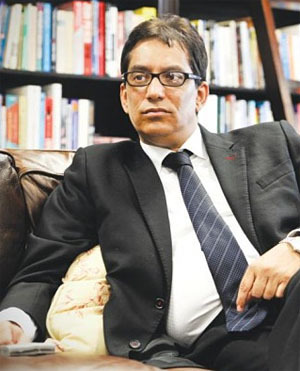 Iqbal Survé, founder and chair of the Sekunjalo Group, has come out strongly in defence of Fedusa general secretary Dennis George, who has been placed on special leave by the union pending an independent investigation into whether or not he personally benefitted by acquiring shares in AYO Technology Solutions. Survé, who is also the chairperson of Independent Media, was on Thursday speaking at a pre-State of the Nation lunch at the Mount Nelson hotel in Cape Town with Speaker of the National Assembly Baleka Mbete as the guest of honour. George, Judge Advocate Dr Wallace Mgoqi, founding chair of Sekunjalo Group, and Sello Rasethaba, chair of the Black Business Council and a director of AYO Technologies, were the other speakers at the event. Survé said he was shocked to hear how the media has treated George. George was placed on special leave by Fedusa on Monday pending a probe into the purchase of shares in AYO Technology Solutions. He is a non-executive director of the JSE-listed IT services company. George has denied any wrongdoing, saying he was facing “baseless allegations” and had already answered questions put to him by Fedusa. As Fin24 previously reported, according to an article by amaBhungane, George may have benefited personally from the AYO deal via a company called Difeme Holdings which, it reported, received pre-listing AYO shares at R1.50 a share. The PIC acquired the AYO stock at R43 a share. Fedusa said on Wednesday that it never gave any "mandate for the acquisition of shares from any company in the name of the trade union". The union dismissed what it called an attempt to link it to Difeme Holdings. How and why state asset manager the Public Investment Corporation in December 2017 acquired shares in AYO has featured prominently in the commission of inquiry into the PIC. Following allegations of lax oversight of investment at the commission, all remaining PIC board members resigned last week. "It is shocking when I hear how this wonderful man Dennis George is handled by the media," Survé said at the lunch. "When we listed AYO Technologies, the executive team came to me and said since I always talk about broad-based and inclusive empowerment, what do I think they should do in this case. I said, 'Let us invite labour unions to invest in AYO by allocating 10% of the shares to them at R1.50 per share." Survé said he is not going to apologise to anyone for doing that. "The only problem with some of these unions now complaining on (certain media) is that they did not get the opportunity to participate. We are deeply and genuinely committed to real empowerment and not superficial empowerment," he said. "Take off your hats to Dennis George. He is a man of absolute integrity, who deserves to be commended and not treated the way some media have treated him." George, in turn, said Survé has always told him that SA needs to have knowledge workers and a knowledge government to address the issues of good governance in SA's companies. "We need to deal with the protection of the environment and with social inclusivity. That is why Dr Survé allowed us to invest in AYO," said George. "He told me, 'Dennis, how will we be prepared for the 4th industrial revolution? How will our children have the necessary skills?" George praised Survé for insisting that workers be on the boards of Sekunjalo companies. "He believed in the teachings of Karl Marx who wanted to overthrow the capitalists. I want to congratulate Dr Survé for his transformational leadership," said George. On Sunday the Sunday Times revealed details of a secret recording of Survé and board members of AYO where they appeared to discuss withholding information from the PIC prior to AYO's listing. A joint statement from the boards of African Equity Empowerment investment, AYO Technologies, Sekunjalo Investment Holdings and Survé, issued Monday in response to the recording, stated that it detailed a mere “informal discussion”. "There is not a single lie that has been told to the PIC, as has been suggested in the press report, and the Sekunjalo Group, AEEI, AYO and Dr Survé continue to feel aggrieved by this unfair treatment in the public domain," the statement read. On Thursday Survé said, "We are never afforded to give our side of the story." "We have built the largest black group in this country. We built it without exploiting the resources of our country and by relying on the intellectual property of SA. It is about job creation and bringing technical skills to Africa in line with the 4th Industrial Revolution." He said SA's future lies in setting up regional centres to train young people in data science, software engineering and other technical skills. "The only way to do this is for our capital markets to start investing in technology and technology platforms so we can train young people. That is the dream of Sekunjalo," he said. "We took the risk and invested billions in technology so Africans can be the masters of their own destiny.